Check out our awsome pictures of window treatments ideas contributed buy many talanted people. Coming up with ideas for interesting window treatments in kids rooms may seem like an impossible endeavor, especially when you’ve exhausted all your creative genius on the rest of the room’s décor. But if you look for window treatment ideas that incorporate the windows into the room’s overall design, the whole job will be a lot easier. The first places to look for ideas are in magazines and books. 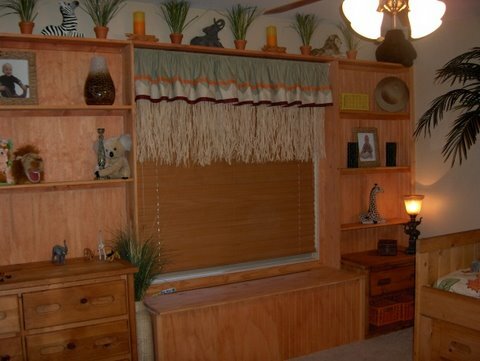 Start collecting pictures of window treatments that appeal to you. 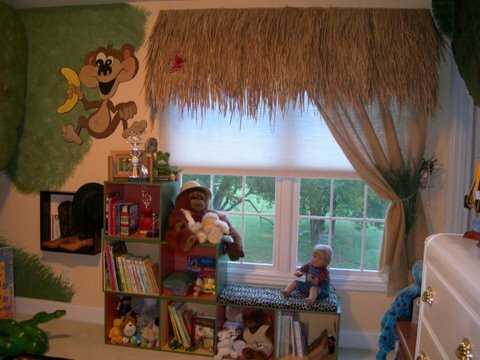 At this point, don’t worry about recreating the exact picture; you can use bits and pieces of many pictures to create your own custom kid’s room window treatments. Ideas will begin to formulate while thumbing through all the pictures. Once you find a few styles you like, you’re ready to begin. Take a purchased window shade and dress it up by gluing fabric to it, or painting it to match the theme of the room. Stencil the shade with paint and add a decorative pull that coordinates with the room’s decor. For a seamless look that blends the window with the room, paint a window shade and the window casing the same color as the wall. This is a particularly interesting technique for themed rooms such as celestial or underwater décor. The ocean or the sky can continue straight across the window. Paint clouds or waves on the facings, curtains and window shades. For a submarine setting, paint a mural on the wall to facilitate the interior of a submarine. Construct padded window panels that cover entire window, and cut a circle out of the panel. The window then becomes a porthole. 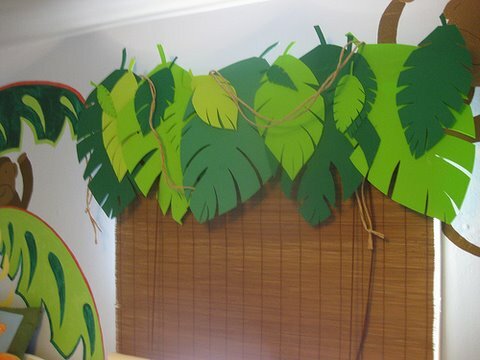 Look at pictures of cornice boards and try to find one that you can modify to fit the room. Adding a cornice to a window is like adding a crown to the regal head; it gives the whole window importance. However, it has to draw attention and stake its claim to the room’s décor. Whether you’re looking for window treatment ideas for girls’ or boys’ rooms, cornice boards can be customized to complete any décor. Little girls love pink and purple. 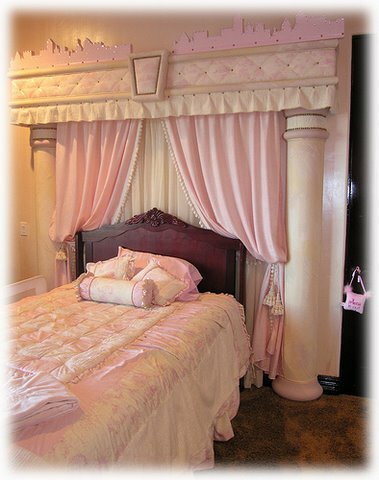 A cornice covered in pink or purple faux fur makes a bold statement for a girl’s room. When you add big contrasting tufted buttons and glistening gossamer sheers, the window becomes a huge part of the overall décor. Think bright pink and lime green, or purple and hot pink for the cornice, but to make the window treatment really pop, use pastel versions of the color on the walls. Polka-dots and stripes also make fun statements. Use a solid-colored fabric for the window curtain and trim the edges with a coordinating striped fabric; use the same solid-colored fabric to cover the cornice, then paint polka-dots on it in a random pattern. Complete the look with self-sticking dots on the panes of glass and on the walls. Most boys love sports. Think ball bats, baseballs, footballs, or any type of sports paraphernalia to jumpstart your creative juices and come up with ideas for interesting window treatments. Rip a ball bat down the middle and mount the flat side to a cornice or screw it directly to the window casing. Use ball gloves as tiebacks for the curtains, and baseballs as finials on the end of rods. 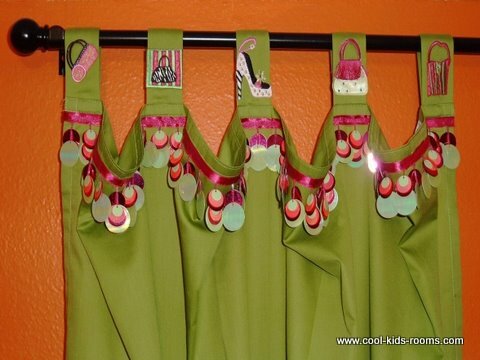 Beads or string curtains are interesting window treatments ideas, particularly for kids who are past their youngster years. They’re whimsical, fun and sophisticated enough to please even the finicky teenager. Top them with valances or cornices, or leave them as stand-alone curtains. They fit perfectly in a retro-themed room. 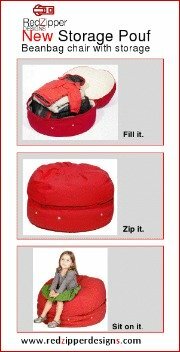 It’s all about individuality for the tween and teen. They want to create their own space, and they want it to reflect their interests. Set your teen girl’s heart aflutter by creating an arched cornice that extends all the way to the floor, framing the window. Cover a light-weight window screen with sheer fabric and slip it inside the window frame. Use push-pins to hang pictures of her favorite heartthrob on the screen. As the object of her affection changes, she can change the pictures. 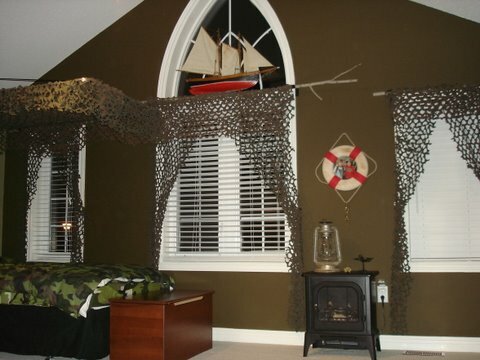 Ideas for interesting window treatments for teen boys are apt to favor a techno-oriented décor. Think straight, rigid lines at the window. Sleek silvers and metallic surfaces get the male’s attention. 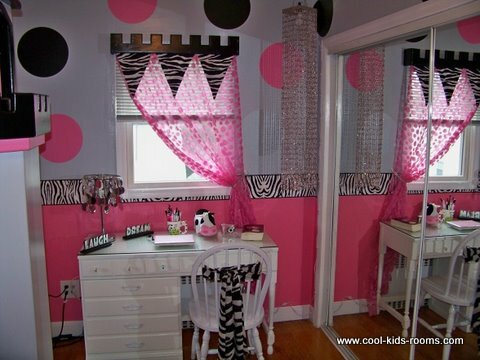 All kids, regardless of age, want a room that’s uniquely their own, so get them involved in the decorating process!